1-week break after today's match. Daaaaamn. I keep missing the matches. Are Nanoha and Fate still in it? let's vote for round two! the results for the 2nd round of the emerald period is now available! let's vote for the white devil of the Time Space Administration Bureau! Fate was against Saber two match days ago. Didn't vote for a while. round 3 results are out! Fate is at the brink of being in the top 16 again! she's at the 17th spot right now! if Fate wins this match up, she will be in the top 16 once again! a very pivotal match for her! and of course if she qualifies for the top 16 at the end of the following periods, she will be qualified for the playoffs that will yet to come! Oh damn, Nanoha VS Ushio, sorry Ushio, going for Nanoha. hey guys! it's time again to vote for the ISML! round four of the emerald period starts today! 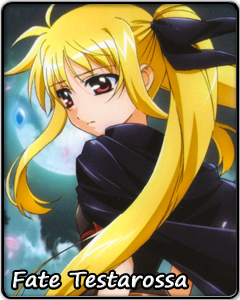 vote for nanoha and fate! if fate wins this, she will be in the top 16! Voted too, the two of them have to win ! Voted for the two again! I've done my deed, too.